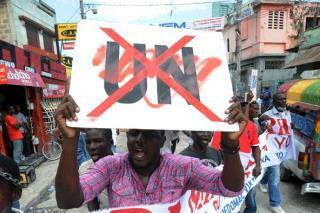 (Newser) – A deadly cholera outbreak in Haiti has killed thousands and triggered protests outside a UN peacekeeping base that first leaked the disease into local water supplies. Now the New York Times looks inside the UN mission, its refusal to accept blame for the outbreak, and the internal bickering that stymied efforts to stop it. “This unfolded right under the noses of all those NGOs," says the co-founder of a health care NGO. "And they will ask, ‘Why didn’t they try harder? Why didn’t they throw the kitchen sink at cholera in Haiti?’"
Crisis require strong leadership and hierarchy. Democracy is for the day to day world. Haiti needed a benevolent dictator when the quake hit. They got bickering factions. Signifies old saying, "Too many Chiefs, not enough indians"